Winter driving in Canada can be a nightmare if your car isn’t properly equipped. White-out conditions during heavy snow can make it downright impossible to see two feet in front of you. Even on a relatively clear night, those wet roads from melting snow cast reflections that make the road darker than usual. Bottom line, without good headlights, you’re driving blind. The first time I drove at night, it took me an entire hour to go ten minutes away! It was a dark and snowy night. Sound like the beginning of a horror movie? To me, it was! Trust me, I was terrified! My headlights were far from appropriate. Prepping your vehicle for harsh winters is a must here in Canada. There’s no way around it. That time is coming fast, my friends! I took my first big step by installing SYLVANIA’s SilverStar® ULTRA headlights. 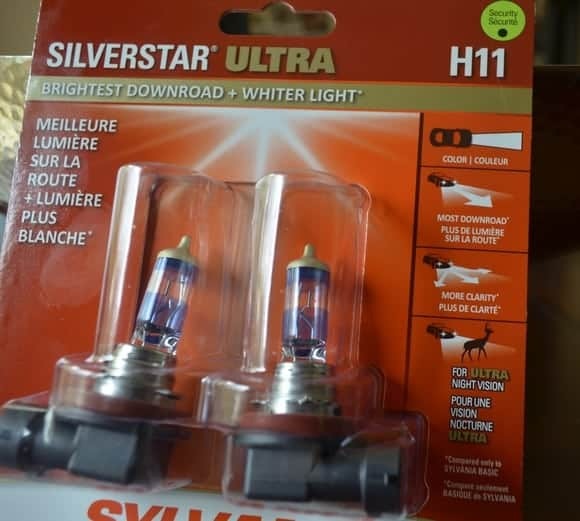 I love the SYLVANIA’s SilverStar® ULTRA headlights! I can see so much better. My street only has one small dim light. 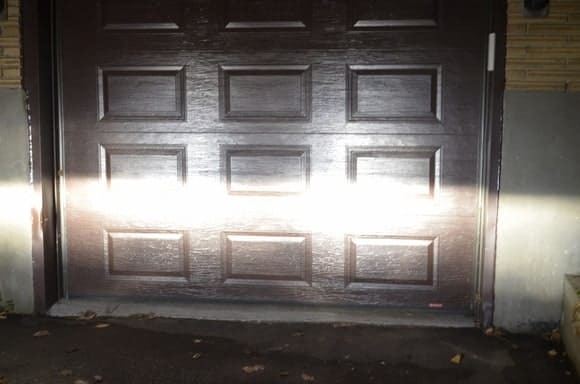 Look at how my SYLVANIA’s SilverStar® ULTRA headlights lights up the road! SYLVANIA’s SilverStar® ULTRA headlights are “Plug and Play” orientation, which means they’re no harder to install than standard halogen lightbulbs. Go ahead and play “spot the differences,” I’ll wait! 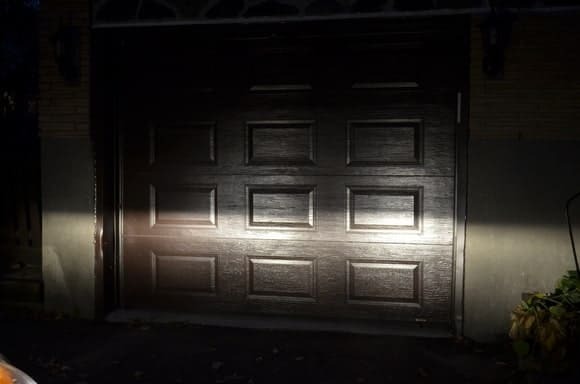 Seriously, in the first picture, you can’t even see the bottom of the garage, let alone all the leaves on the ground. Along with installing SYLVANIA’s SilverStar® ULTRA headlights, we have a couple more winter driving tips for you, courtesy of SYLVANIA. Don’t skimp on winter tires, they give you more stability and control when breaking in harsh conditions. Keep your gas tank at least half-full to add a bit of weight and traction when driving on slippery roads. Stay alert and avoid distractions. While you should NEVER talk on your cell or text when driving, it is especially dangerous in the winter. Keep your family safe this winter by prepping your vehicle and using good driving habits. Visit SYLVANIA to find out how you can see better this winter. Follow SYLVANIA on Facebook and Twitter to keep up with news and great driving tips. This post is brought to you by SYLVANIA Canada. All opinions are mine. Give Your Table a Patriotic Makeover for the 4th of July! Hubby’s car needs these. I’m going to tell him about this. He’ll be happy I did. I think my boyfriend’s van needs the headlights switched out. I’m going to mention these because his are so dull. My husband is always complaining the headlights aren’t bright enough. I’ll have to tell him about these! 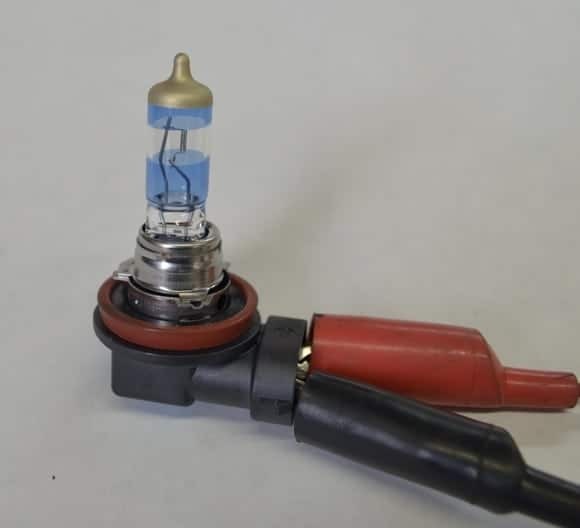 My husband is admit about changing our headlights every few years! Thanks for the reminder! I could really use a set of these. My headlights are not nearly as bright as I’d like them to be! This is great to know! 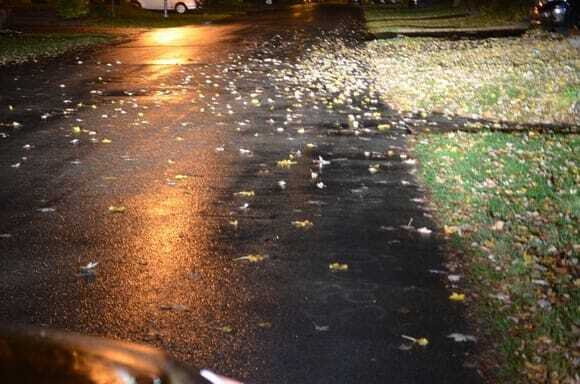 My street is pretty dark too! Good difference, I will look for these. I remember in college driving from Allendale, MI to Chicago was a nightmare. The roads are dark and lonely. Having a set of dependable headlights is always encouraged, especially for young women on the highway alone! Wow, that after photo is totally amazing. Wow, I totally need new headlights and these seem perfect. Wow that is a huge difference! I need these for outside of my house! Okay, that’s awesome. I always complain that I don’t think my headlights are bright enough. Definitely checking these out. Ah, the joys of Canadian driving. Toss in the time change and suddenly night just came that much earlier. Will have to pick up a pair of these asap! We are out a lot when it’s dark…seeing isn’t optional. I do agree that headlights can make all the difference. We need to clean ours and replace the bulbs. Thanks for the reminder. I need better headlights on my van! We have a lot of deer in our area and they are hard to see! My husband and I were just discussing out Jeep’s headlights the other day. I think it’s about time to replace them. So this came at a great time! I live in northern New England and we have some of that terrible winter weather! Glad to have the reminder to be sure to winterize my car. Headlights are not something I had thought about! Wow! These sound really great. We have similar weather conditions here in Maine (along with many deer in the roadways), so I might just have to get my husband to take a look at these! I recently attended a winter driving event that focused on winter tires and I was amazed at the difference vs all-season tires. I never considered that headlights are also a major factor in being prepared. Thank you for the heads-up. These show a significant different in brightness. Great for the upcoming winter and darker hours. I will have to remember this the next time my headlight goes out.